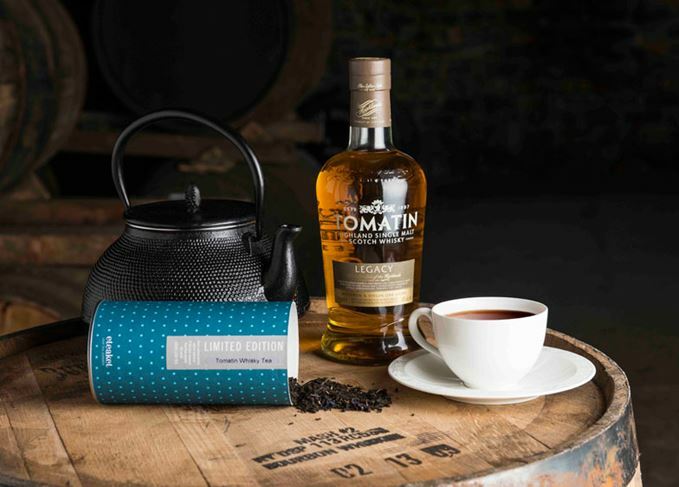 Highland distillery Tomatin has introduced Scotland’s first whisky barrel-aged tea, alongside the second single malt release in its Warehouse 6 Collection. Whisky-flavoured tea is no new thing, but it has been just that – flavour – until now. Highland distillery Tomatin has collaborated with Edinburgh-based tea brand Eteaket to release Europe’s ‘first’ whisky-aged tea leaves. Matured for seven days in an ex-Bourbon barrel used to age whiskies for Tomatin Legacy, the tea has been infused with flavours still lingering in the empty cask. Whisky is sometimes drunk with tea in parts of Asia, but this non-alcoholic blend of leaves, using a combination of Assam, Ceylon and Fujian teas, is claimed to be a genuine European and Scotch first. While Tomatin revealed the process ‘raised a few eyebrows at the distillery’, their ‘thinking-outside-the-barrel’ approach continues to grow. Meanwhile, a more traditional Tomatin release is the new 1972 vintage single malt in its Warehouse 6 Collection. The second release in a series of six, it is bottled at 42.1% abv and limited to a run of 380 bottles. Aged in three ex-Sherry hogshead casks over four decades, the 1972 expression is presented in a Glencairn crystal decanter along with two crystal glasses, inside a wooden presentation box. Its release follows that of the Tomatin 1971 vintage, which launched the Warehouse 6 Collection in August last year. The Tomatin Whisky Tea is available from the distillery and from eteaket.co.uk priced £6.95 for 50g. The 1972 vintage will be available via select specialist whisky retailers from mid-August, priced £2,000. Only 300 bottles of the third expression in the Warehouse 6 Collection have been made. The collection has been designed to be mixed with spirits such as Scotch whisky or sipped neat.